The Life Insurance Medical Exam is the opportunity for your life insurance company to review your medical history and basic information that was used to make your life insurance application. The life insurance medical exam will usually be performed by a qualified medical professional like a nurse, not a doctor. Standard and basic sample collections: During the life insurance medical exam you might be required to give a sample of urine and blood. These tests are simple enough that they can often be done in your home. You should be notified in advance by your life insurance agent or broker which tests they will be doing. In most cases, you do not have to go to a hospital or medical center for a life insurance medical exam. 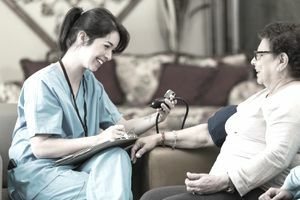 A life insurance medical exam is often done at home. The medical professional who will come and do the tests will bring a kit with them to collect samples from you. The exam takes about 20 minutes to thoroughly review your medical history verbally with the representative who will come to do the exam. Then, it takes only a few minutes to take the samples. To take a full medical history of the applicant: The questions on the life insurance medical exam go more in-depth into your medical history and your family members. If the company determines you are likely to die at an early age, they will want to collect higher premiums early on. If the company feels you will live longer they may not need to collect as much from you in the early part of your life because they may determine that you will be around longer to continue to make premium payments. To identify any underlying medical conditions. Medical conditions such as diabetes, inconsistencies in the blood work, or HIV that the applicant may not be aware of or may not have declared. The compnay will also verify drug or nicotine use. The information from the medical tests will be matched against the sample test results. Longevity charts are statistics on the mortality rates of people and are used by life insurance companies. Longevity charts give an insurance company statistical information on how many men, women, and children die at various ages. This information can help an insurance company determine what risk they are taking. For example, say a longevity chart reveals that men at age 29 die more frequently than women at age 29, from this statistic the insurance company would be taking a larger risk by insuring a man than a woman. Your medical history including any hospitalizations, medications, procedures you have had, or conditions. You will be asked a series of questions to make sure you did not forget to mention anything and to give you the opportunity to reveal your full history. Name, address, phone number for your primary doctor as well as any other doctors who you have visited in the past few years for special consults or medical situations. Have all these contact details handy. After undergoing the medical exam your insurance company will review the results to determine if you are insurable and what premium they will charge you. The time to fully process the information and samples could take up to a few months. Depending on the insurance company, the starting point of coverage may vary, each insurance company works with different rules. However, many life insurance companies may start coverage from the time you sign the original application of insurance. In these cases, if all the information checks out from your original application and the information collected during the exam, then you would be insured during the time it takes to get all the results. If you paid your insurance premium at the time you made your application for insurance then the coverage may begin on the date you applied for the policy provided everything checks out, as explained above. If you did not pay a premium when you submitted the application, then you may have the type of policy where coverage begins only after you have been accepted. Your life insurance agent is the best person to confirm this information for you and normally will explain this to you when you apply. Keep in mind that life insurance policies also contain a contestability clause which allows them to deny life insurance benefits for a variety of reasons in the first two years of any policy. Make sure you understand your coverage terms while you wait for your confirmation that a policy has been issued. If the information you submitted on the original application does not match the data collected during your medical exam, then you may be denied coverage, or you may receive a request for additional testing. Be careful because your life insurance policy may not be in force as a result of the change of circumstance. If you failed the medical exam or feel something on the medical exam was inaccurate you'll want to ask the insurance company to send a copy of your medical exam results to you, or your doctor. This way if you failed because you have a health problem you can address that with your doctor. But, if you failed because of a mistake by the insurance company, you and your doctor can remedy the situation immediately. That way, your mistaken results will not stay on your health record and cause you to be denied for other insurance. This is determined on a case by case basis, but as a general rule if you would have been accepted and the policy term starts at the time of application, then there is a good chance the beneficiary would receive the payment. However, if you would have been declined due to any reason, then the policy would not have been considered issued and so your beneficiary would not be paid. If there is a clause in place like the suicide provision, for example, or any clause that excludes coverage for the cause of death, then the policy would not pay. This is one of the topics to discuss with your life insurance representative. You'll want to be sure you understand the specific terms of the policy you have applied for. Every life insurance company has their own terms and conditions, as well as policy effective date. If you have failed a life insurance medical exam and have been denied coverage, you should contact a life insurance broker who has access to several life insurance policy types and companies. A broker may be able to find you coverage. You should also find out if your employer can offer you a policy. Often employee benefit life insurance policies do not have medical exams. Just because one life insurance company declines to insure you, it does not mean all of them will. Get all the facts from a licensed life insurance professional or contact your state insurance commissioners office to get the most information to find the right life insurance policy for your needs.